An interesting and cool documentary that provides an intriguing mystery in its first half, but then slips off the path as it starts revealing answers in it is second half. 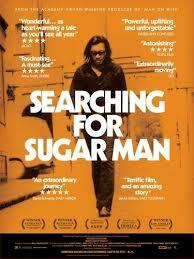 Searching For Sugarman is a documentary about the search for the story of a certain musical artist. 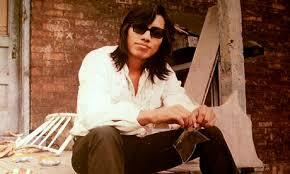 That artist was named Rodriguez, and his songs were great. However, there was a mystery around him, where nobody really knew who he was or how to find him. Nobody even really knew anything about him. That is the premise that the movie is based on. This guy, Rodriguez, is kind of a legend. Especially when you consider the stories that people told about him. One was that he got on stage one night and lit himself on fire and burned to death. Another is that he got on stage and put a gun to his head and shot himself. However, nobody actually knew him or knew the truth about what happened to him. They just knew the stories. The reason why this became relevant and an issue are because the music of Rodriguez became very popular in Africa. It never did any business here in the states, but over in South Africa, everybody knew Rodriguez. Everybody knew his sound and could recognize his music. In addition, how all of this got started over there, and people first became aware of his music, was another mystery. The common theory to that was that somebody from America came and brought over a copy of Rodriguez’s album, and then from that, numerous other copies were made. Somehow, people started talking and this music became a hot topic. Everybody had a copy and everybody loved the sound. The movie follows a man in South Africa who ran a music store and decided to make it his mission to find this Rodriguez or to find out what happened to him. He put an add in a paper challenging anyone who knew anything to contact him. Somebody over in America, who had been a part of the record company that made Rodriguez’s album, contacted this man and pointed him in the right direction. That direction was to point to the music producer who has published Rodriguez’s album and put it out there into the public. And so this music producer was interviewed, only didn’t really seem thrilled with being a part of this movie. He felt like he was being accused of accepting money that might have been meant for Rodriguez and hen lying about it. That is because the companies that sold Rodriguez’s album said they were sending money back to this producer, only he says he never saw a dime. I love the way the movie finds people who had seen and dealt with Rodriguez before and questions them about what he was like. In addition, I love the way that nobody really knows. The music producers that hired him saw him for the first time playing in a smoky nightclub with his back to the audience. It was difficult to see anything through the smoke, and whatever myth there was about Rodriguez came out of moments like this, where nobody could really see his face. The movie is actually divided into two halves. The first half traces over the mystery of trying to find out what happened to Rodriguez. There are all different theories, and they are all asked in the first half of the film. That half is fantastic. At one point, a guy who is looking for answers examines the lyrics to one of Rodriguez’s songs and tries to look for places that stand out or give clues to where Rodriguez might have been living when he made the album. If the mystery had gone into the second half of the movie, it would have been a better film. However, unfortunately the first half is about the questions and the second half is about the answer. The second half wraps everything up and provides us with a major shocking moment. However, after that one moment, it is downhill. Once the secret is out of the bag, the mystery is gone. At that point, the movie traces over where things are at present day and what is happening with the music. It is not half as interesting as not knowing the answers and trying to put the pieces of the puzzle together. I know that these answers were necessary, but they are kind of like the climax of the film and should not have been revealed so soon. Instead, we should have spent more time pursuing the mystery, and the answer should have only come out at the end. Even still, it is a very cool movie that just lost some of its momentum in the second half.